We eat with our eyes first and so it shouldn’t be such a surprise to say that the way I found Jennifer Farley was through her photography. Her sense of minimalist style mirrored my own desire to let the food speak for itself without much adornment. Last Fall, her cookbook The Gourmet Kitchen came out and I toted it along with me on a trip, doing my first pass of marking recipes to cook and making annotations in the margins. We dined on her Broccoli Cheddar Baked Potatoes (p. 124) finding the double-baked approach a delightful way to enjoy that stellar pairing of broccoli and cheese. Her Poached Salmon Soup with Udon and Mushrooms (p. 72) is unbelievably easy and warmed us on rainy days. We noshed on Baked Acorn Squash with Garlic-Yogurt Sauce (p.140), an Afghani dish also known as kaddo bourani, as it reminded us of a favorite wedding anniversary meal several years ago. The Quinoa, Blueberry, and Almond Salad with Honey Lemon Mint Vinaigrette (p. 96) is on the menu this week for lunch, and I’m jonesing to prep the Sesame-Crusted Tofu Salad with Spicy Peanut Dressing (p.87) using some Hodo Soy tofu that’s in the fridge. Can you think of anything more decadent for dinner celebrations than Jumbo Lump Crab Pot Pie (p.185)? I’m not sure I can wait until next Christmas to make the Orange Cardamom Cinnamon Buns (p. 45), though I know I’ll have to wait until that sliver of time in September to make the Peanut Butter and Jelly Shortbread Bars (p. 261) since the Concord grapes necessary for the Concord Grape Curd (p. 222) aren’t in season until then. I initially became familiar with the author through her exquisite photography and blog, Savory Simple. Gourmet Kitchen gives Farley more room to dig deeper into au courant flavors like the Spicy Gochujang Chicken Wings (p. 168) or Salted Caramel Toffee Ice Cream (p. 209). She shares tricks from her culinary school training in methods like how to make ghee (p. 5) or in tips noted in the headnotes like using the corn cobs to make the corn stock for her Chilled Summer Corn Soup (p. 75). This is a cookbook for people who like to cook. Her recipes offer a straightforward approach to introducing sophisticated flavors into recipes easy enough for weeknights and others to pull out for parties. In preparation for January 10, I pulled down my copy of The Gourmet Kitchen for one simple reason on page 253. Some friends knit pink pussyhats. Others made signs on poster board with permanent markers. Still others boarded airplanes bound for DC. 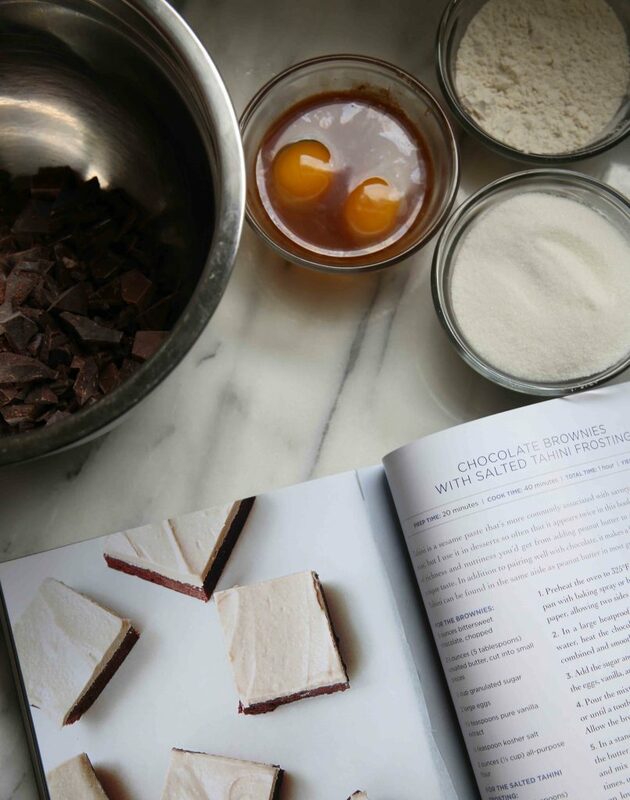 I baked Jennifer Farley’s Chocolate Brownies with Salted Tahini Frosting. I couldn’t shake the vision of offering something sweet to others who decided it would be a good idea to march for whatever reason that brought them out. See, I have this crazy idea that if somehow we could all sit around a table and eat good food, we might be able to listen to one another, or at the very least give each other a chance to be seen. I’ve made these brownies twice and here’s something true: both times these brownies made friends and strangers smile. And, isn’t cooking or baking all about bringing a bit of something sweet into someone else’s life? Maybe that’s the real secret of the gourmet kitchen. Preheat the oven to 325°F. 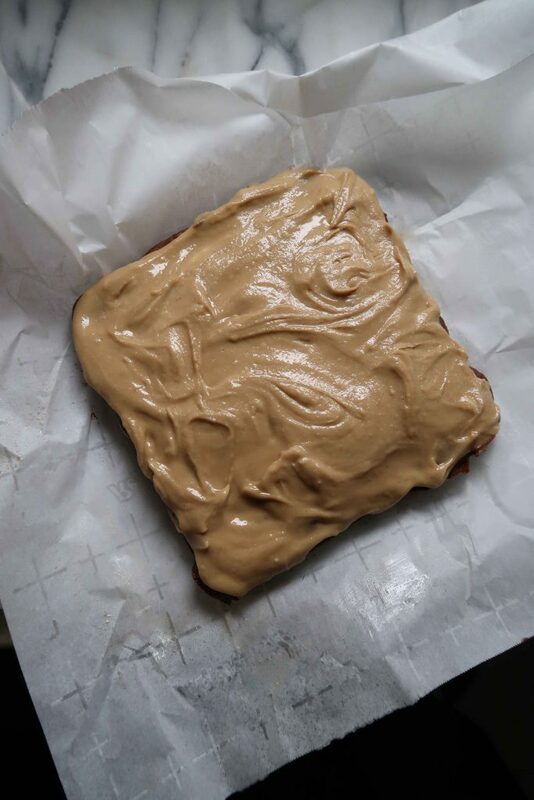 Grease an 8×8-inch brownie pan with baking spray or butter and line it with parchment paper, allowing two sides to hang over the edges. 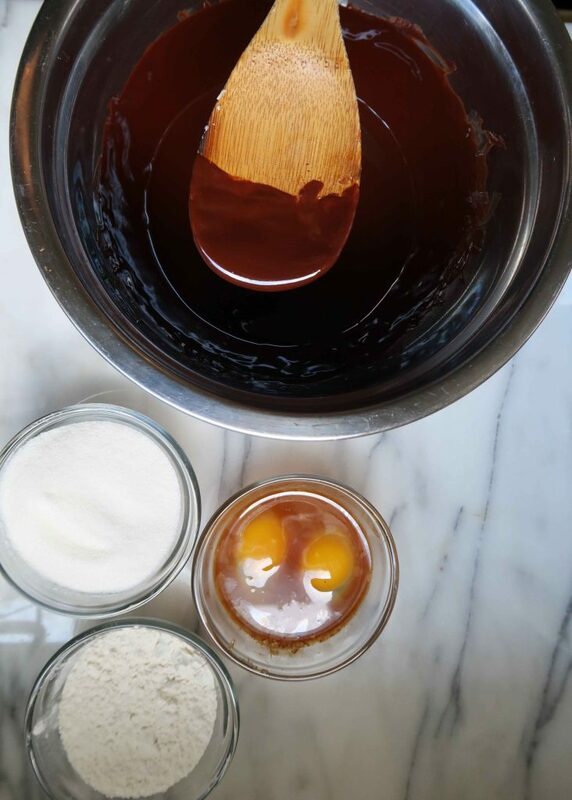 In a large heatproof bowl set over a pot of simmering water, heat the chocolate and butter, stirring until evenly combined and smooth. Remove the pan from the heat. Add the sugar and whisk vigorously until smooth. Whisk in the eggs, vanilla, and salt. Sift in the flour and stir until smooth. Pour the mixture into the pan. Bake for 30 to 35 minutes, or until a toothpick inserted into the center comes out clean. 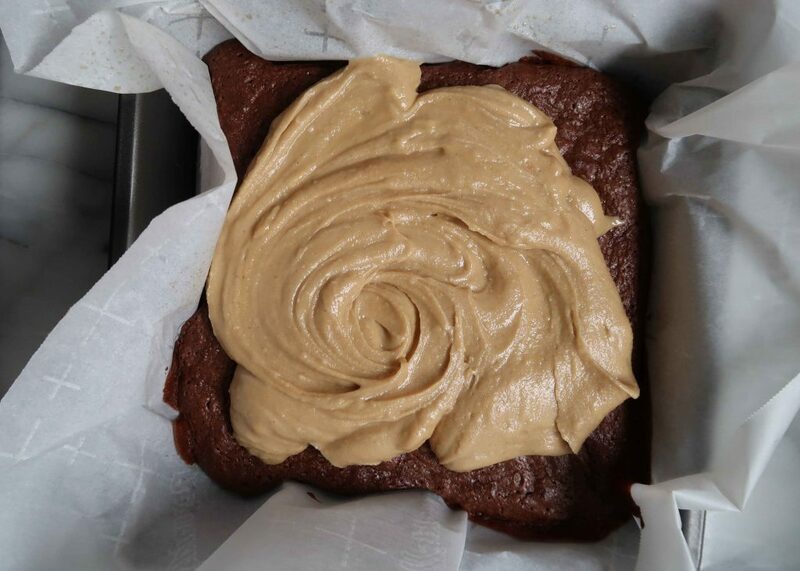 Allow the brownies to cool to room temperature. 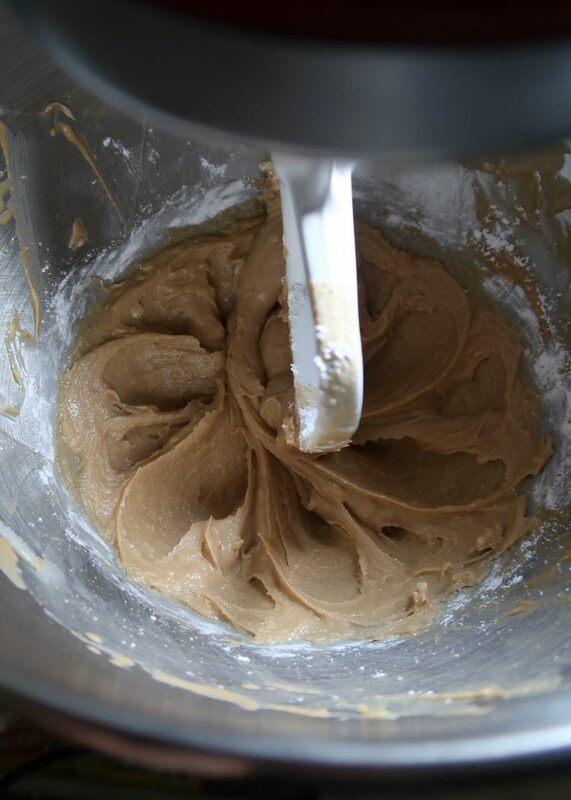 In a stand mixer fitted with the paddle attachment, cream the butter on high speed until light and fluffy. 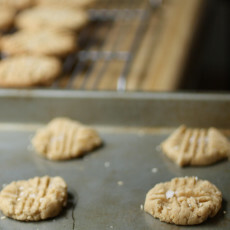 Add the tahini and mix on medium speed, scraping down the sides several times, until evenly combined with the butter. With the mixer on low speed, add the sugar and salt. Mix until the dry ingredients have incorporated. Scrape down the sides and turn the speed up to medium-high, allowing the frosting to mix for another minute, until light and smooth. 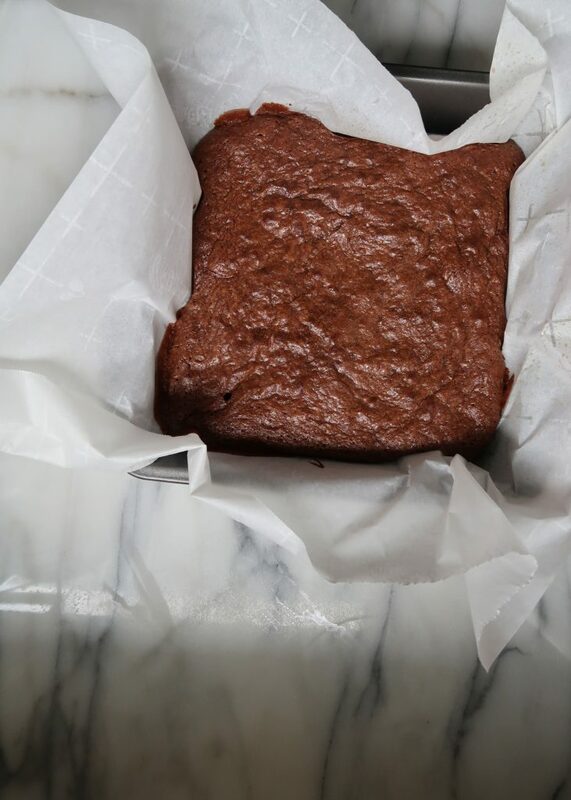 Use the excess parchment paper to lift the brownies out of the pan and place them on a cutting board. Use a spatula to evenly frost the brownies. Cut the brownies and serve.